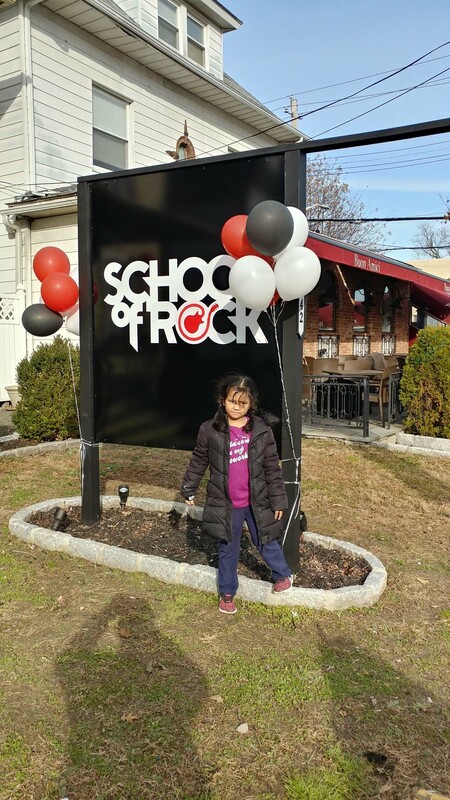 School of Rock just opened a new location in White Plains, about 20 mins north of us. Its a franchise that claims to be “a music school for all skill levels, ages, and musical aspirations. With students ranging from toddlers to adults, School of Rock is where music students grow into real musicians.” Facebook has been running ads for it for the past few weeks, which put it on my radar. Today was the grand opening, so I packed up Bopps & the wife, left the baby with my parents and we took a trip to satisfy our curiosity. We were impressed with their setup, and by the end of it had signed Bopps up for weekly guitar lessons. The school basically caters to small groups of people, usually no larger than 6-7 people, in a similar age bracket. For Bopps, that age range is 6-7 years old. They’re able to experiment with guitars, basses, keyboards, drums and vocals to see what they like, and then they can take lessons focused on a given instrument. As per the grand opening, potential students were given a free 30-min lesson, so we left Bopps with a guitar instructor and toured the facility. So, this week I started practicing major chord inversions as a warm-up exercise on bass. Inversions are chord permutations. Right now, I’m just doing really basic ones – we take a major chord (root, 3rd, 5th) and change the order of the notes being played. Root position: This is the standard chord sequence. We play the root, the 3rd and the 5th, in that order. We can also add the octave, if desired, since its the same note as the root. 1st inversion: Here, we play the 3rd, 5th and then 1st. So, instead of 1-3-5, we play 3-5-1. The 3rd essentially becomes the bass note, or lowest note of the chord, instead of the 1. We can add the bass note again, at the end, so it can be extended to 3-5-1-3. 2nd inversion: Here, we start on the 5th and move up, so we play 5-1-3. Like before, we can extend this with the bass note again, making it 5-1-3-5. Those patterns can be played on any root, or in any key, of course. If you play in F-major, you’ll need to account for open strings, of course. This might be true for other keys way down the neck as well. Now that I’ve started practicing inversions, I think about them as the equivalent of modes, but for chords. The mode of a scale uses the notes of a given scale, but starts on a different note. For example, C-Ionian starts on C. D-Ionian uses the same pattern/notes, but starts on a different root. Inversions use the notes in a chord, but start on a different chord tone from the root and add the other chord tones by ascending. The other day, I watched Adam Neely critique the movie Whiplash (2014), which I dug when I saw it a few years ago. Its a story about an ambitious and talented jazz student and his volatile, perfectionist instructor/big band leader. It was… intense. Adam enjoyed it as a movie, but didn’t find its connectivity to jazz accurate, and felt that it was mean-spirited – which concerns him as its currently the only representation of the jazz school/musician scene on film. I’ve been practicing on-and-off over the past few weeks, but I’ve not been blogging much. Some practice material has been from the Hal Leonard Bass Method and some has been from YouTube videos or snippets I’ve read from other books, and in a few cases even from perusing older posts here! Its been a while since I posted a warm-up exercise, so this is what I’ve been using this week. Its just a small Phrygian pattern using all 4 fingers that I run along the Cycle of 4ths on the E string and then again on the A string. The Schecter Stiletto Studio-5 is an amazing bass. Its easily my favorite, out of the ones I own. As much as I love how it feels and plays, there were two things I wanted to change as well – (1) the bottom of my strap kept coming loose from the bass, so I needed to find a way to keep it secured and (2) I wanted strings that were smoother to the touch so that I can practice more easily, and I also don’t prefer how most roundwound strings sound – they tend to have twang that I don’t like in a bass. A few weeks ago, I looked to Sweetwater and ordered two items to correct the issues I had with the bass. The first was a set of Dunlop strap locks. I’ve never used them before, but what I learned of them online made it seem like they were the solution to the problem of the bass slipping and taking my kneecap with it. The 2nd was a new set of bass strings: La Bella Gold Flats (they come in 4, 5 & 6 string packs). Both arrived yesterday – there was a delay because Sweetwater had received a bad batch of strings, and so was out of the La Bellas that I ordered. About a month ago, I grabbed a Music Man SUB Ray4 from Reverb. While doing that, I learned that Sweetwater was running a promo that allowed almost everything on its site to be bought with up to 48-months of interest-free financing. When I got the Ray4, I was initially looking at a Schecter Riot 5-string. It wasn’t available after I ordered it. This led to my purchase of a Schecter Omen 5-string, which I really liked a lot, but there was fret buzz that I couldn’t get rid of, so I returned it. With the Omen out of my hands, I kept thinking about how the neck felt. I love how the Schecter neck feels. Sweetwater’s financing deal led me to take a leap and grab a bass that I normally would never consider due to its price: I ordered a lefty Stiletto Studio-5. It took a few weeks for Sweetwater to get the bass and then send it out to me, but once they shipped it, it arrived in 2 days via FedEx, and it was worth the wait.